1 What is an Allergic reaction to bed bug bites? 3 What to Do in the case of Severe Allergy? Bed bugs are tiny home pests that resemble apple seeds. They hide in sockets, baseboards, in and under mattresses, in crevices under the bed and even behind the wallpaper. It doesn’t matter how clean your dwelling is. They may enter your home from your neighbours and kiths via voids and sockets in the walls. They may be brought with baggage. An upmarket hotel can be infested with bed bugs as well as a run-down hostel or motel. Blood-sucking activity of these pesky insects can cause raised red skin, inflammation and scratchy welts. 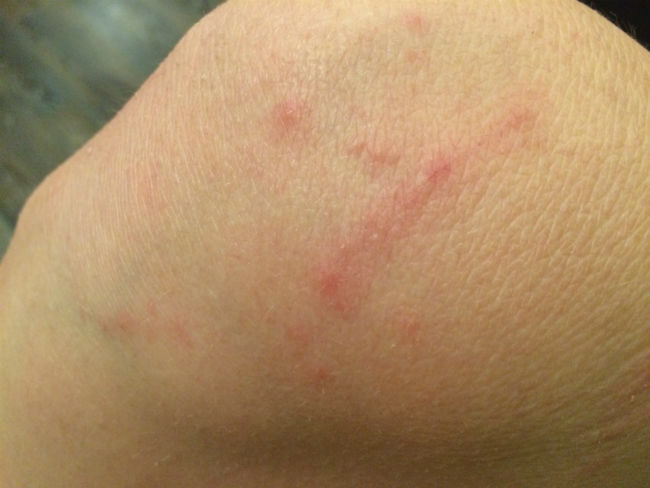 These are the signs of an allergic reaction to bed bug bites. Bed bugs feed on their hosts’ blood when people are in deep sleep. Each bed bug stings three times per night. As a rule, any bites of bed bugs do not hurt at first, as the insect saliva has an anesthetic effect. Though, later they turn into itchy red lumps. What is an Allergic reaction to bed bug bites? Any allergic reaction is a response of the immune system to antigens, or foreign substances, such as saliva of blood-sucking insects. Harmful toxins from saliva of bedbug bites may result in allergy. As a rule, blood-sucking insects inject into the skin their saliva to delay blood clotting. The greater part of humans suffer from mild allergic reaction to bed bug bites. In fact, a common reaction to toxins in saliva is inflammation. You may notice that the skin around the area of the bite is red, inflamed and swollen. Bed bug welts are itchy, painful and tend to be scratched. They may look like a mosquito bite (a white raised lumps), a rash or irritation, or in the form of big red swellings on the skin. They are tender to the touch and have a smell of brandy. If you experience an allergic reaction to bed bug bites, it means your immune system will produce the same response each time it encounters this toxin or antigen. Although most allergic reactions are relatively harmless, others are more serious and can affect the vital systems of a human body. Hives, panting or anaphylaxis and other symptoms are life threatening allergic reactions. Seek medical help in the case of severe allergy to bed bug bites as soon as possible. In practice, the symptoms of an allergic reaction to bed bug bites can be relieved by taking an over-the-counter oral and topical antihistamine medication. They will reduce redness and inflammation. Besides, they will stop the affected area from itching. First, wash the inflamed bedbug welts with warm water and soap. You may place an ice pack wrapped in a towel for 10 minutes to soothe the itching. Then, cover them with an antiseptic bandage to prevent scratching and infection. The best solution in the case of any allergic reaction to bed bug bites is to call a doctor. Take anti-histamine drugs or apply a cream only if your doctor prescribes. The antihistamine topical cream may contain an active ingredient of cetirizine, diphenhydramine, chlorpheniramine maleate or loratadine. Follow the dosage instructions as prescribed by your doctor or directed on the package. In practice, it is necessary to spread a thin layer of antihistamine cream on bed bug welts. It will relieve the effects of severe allergic reaction to the bites. As for pills, your doctor may recommend you to take anti-histamine Zodac, Claritine, or Benadryl and anti-inflammatory Naproxen or Ibuprofen. They will reduce the pain, itchiness and redness in the inflamed areas. Take the pills as prescribed orvdirected in the medication label. Moreover, they come into action in 15 minutes and last 8 hours. What to Do in the case of Severe Allergy? If you experience a difficulty in breathing, call in an ambulance or seek medical help immediately! It is an anaphylactic response to the toxins in the bedbug’s saliva and it is life-threatening. If you suffer from a severe allergic reaction to any bites, you might have an epinephrine injector. It is well-known as an Epi-Pen. So, apply your Epi-Pen directly above the area of the bed bug bites. Then, call for medical help immediately. About 70 % of people worldwide experience an allergic reaction to the bed bug bites in the form of a dermatitis or a red rash. In fact, it will take several days for the itchiness and redness to fade away. Moreover, it is obligatory to exterminate bed bugs at home to protect yourself from their attacks and to prevent allergic reactions to their bites. This is the worst of bugs I’ve ever experienced, all from a friend that moved in and shared her bugs with us! She’s gone but her bugs remain. My grandkids are bit so bad and so am I. Tried everything to no avail. I really feel for you, bedbug infestation is a great annoyance indeed. Make everything possible to get rid of the bugs to prevent more bites. Consult you doctor, he will likely to prescribe you and your grandkids antihistamine drug and solution or gel for topical application. I wish you fast extermination of bedbugs and quick recovery from itchy bites! Gloria, is Tremantine the correct spelling? I tried to pull it up on Lowes website and Google and nothing came up. Thanks! I feel your pain. I’ve never had any kind of bugs my whole life at the age of 31. I had to move into a hotel for a month before a big move me and my family are making. Within the first week I’m covered in bites. Luckily my wife and daughter don’t seen to show symptoms of bites which is common I’ve discovered. As for me, it’s 4:30 a.m. and here I am in this forum trying to figure out what to do. I have never ever had bedbugs I’m a caregiver and my last client I think it came from her but her and her husband had no bits just like my mother mosquitoes don’t bit her but me very allergic to them I’m even allergic to palm trees and bottle brush trees now I love out doors but I just wish I knew were the bugs came from moved here not even a year in a senior apartment . I found bedbugs not to long ago. Had to have them at least two weeks as I also seen babies scatter when I was fixing the mattress cover. Anyways, stripped the bed, put everything in a garbage bag and washed and dried the bedding and all my clothes in my laundry basket. Went to Menards and bought 2 cans of Hot Shot bedbug and egg killer. Sprayed everything twice. Next day sprayed again. 3rd day I wiped down and vacuumed the room, wood floor trim, carpet edges, furniture. Its been almost two weeks. Spraying and vacuuming again just for precaution. New bed with mattress covers on them..hopefully I eradicated this problem. Sounds like you should’ve got rid of them. I used hot shot and it worked fine. I wouldn’t worry too much. Just had heat treatment 2 days ago and got bit. I am allergic and my arm is so painful. I don’t know what to do, I called the exterminator back and he said he didn’t find them. Then why am I getting bit. It’s been 3 weeks. I waited 2 weeeks for him and prepared for the treatment, but am still getting bit. I own my condo and can’t afford to move. My husband is bed ridden and I don’t know why God is letting this happen. If you can’t afford heat treatment, next best thing is to buy a cheap steamer, rubbing alcohol, and diatomaceous earth. Go to town on absolutely every square inch of your home, leave no stone unturned. Steam it, spray it, and lay down excessive amounts of DT, carefully of course because the stuff doesn’t just kill bugs. Not only will the bugs be gone; but you’ll be able to enjoy your nice clean home. A clothing steamer has worked wonders . Kills them instantly. I’ve been dealing with them as well and now I think I’m really making some progress after using the steamer every day or every other day .. it has a wand so I can use it on my daughter’s pack n play without any chemical or mess…. I can see them drop to floor instantly and sweep them up after . I can use it on the crevis on the walls and behind pictures easily . Definitely the best thing I’ve used against the bugs yet , although I would still recommend bed covers specifically for bed bugs because I don’t know how deep the steamer can get it in the mattresses. Then you would be able to just steam the cover and prevent nests in the mattresses .. hopefully soon I’ll have gotten them all.